Photographer: Emma Summerton. Model(s): Aymeline Valade. Source: Vogue Japan. Stylist: Patti Wilson. 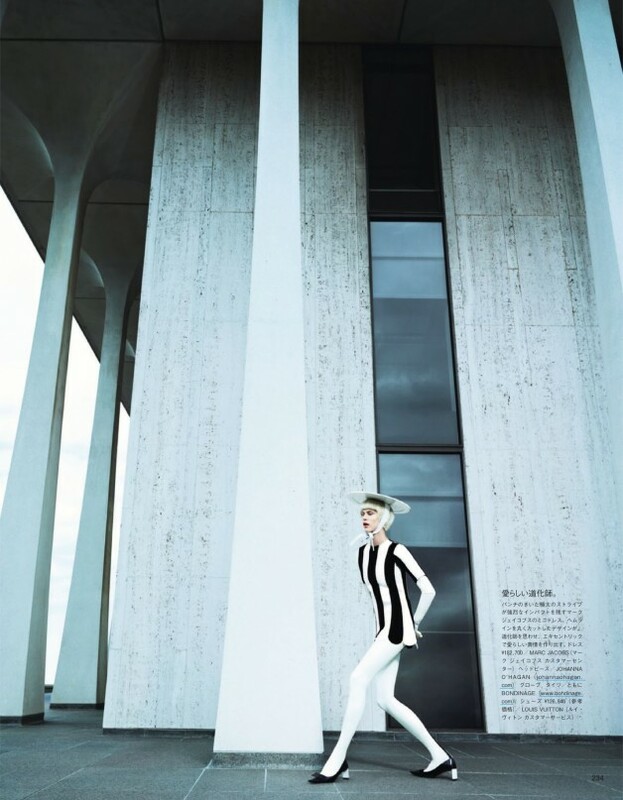 Aymeline Valade learns the fundamentals of fashion in ‘A Graphic Study’ by Emma Summerton for the February 2013 issue of Vogue Japan. Style school is in session with a couture curriculum that includes looks from Prada, Marc Jacobs and Louis Vuitton. Mod goes mad for graphics, with 60’s inspired ensembles re-imagined to meet today’s ‘Retro-Modern’ standards. Lively and expressive, the shape and structure of the original era is honored, while we are introduced to a new breed of patterns, prints and styles. So be ahead of the curve this Spring with designs that mix the boldness of black & white with the elemental elegance of pop-art. It’s the new geometry, learn it. Styled by Patti Wilson, Editorial Source (visual optimism).